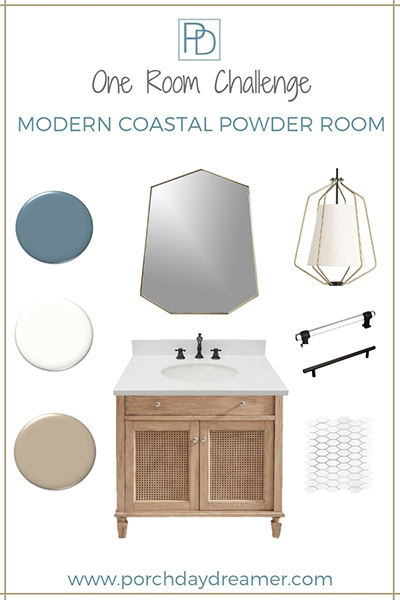 My powder room is going from a misfit to Modern Coastal in the Fall One Room Challenge! Modern Coastal. Doesn’t that sound fancy? Coastal design has many varieties and the modern version is where I am taking the powder room! This week for the One Room Challenge I’ll be sharing my design plans and major product selections. If you missed the details and the before pictures of my powder room, here is a link to WEEK 1. After all of the issues I had during the Spring ORC, my products were selected well in advance to avoid some of the disasters I experienced! 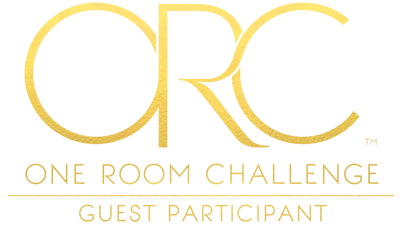 Check out the amazing One Room Challenge designs from both the featured designers and guests by clicking here! What is Modern Coastal? It’s shifting the typical beachy colors like whites, sands, and blue into more sophisticated decor. 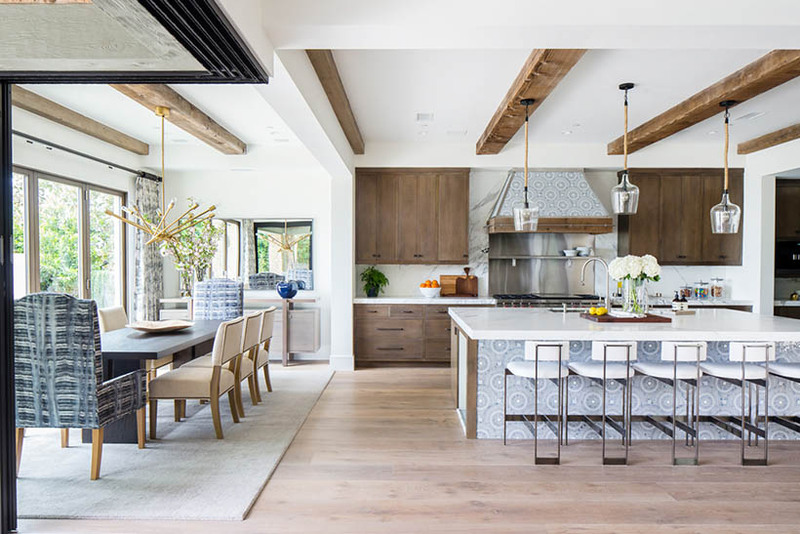 Blending the traditional elements of coastal with more modern accessories and fixtures. Let’s look at some Modern Coastal inspiration because it is totally swoon worthy! If you didn’t know, I have a whole Pinterest board with a coastal theme and two of my other blogger friends pin to it as well. So to say I like coastal everything is an understatement! It’s a mix of driftwood and bleached or distressed woods, white walls, shades of blues, punches of darker colors with black accents, and modern angles. It’s serene, but visually very interesting! 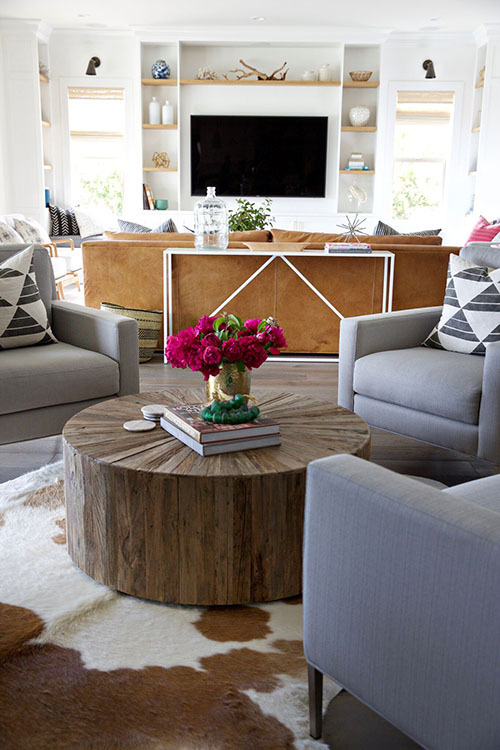 The look is also an eclectic mix of soft and hard together of varying elements. 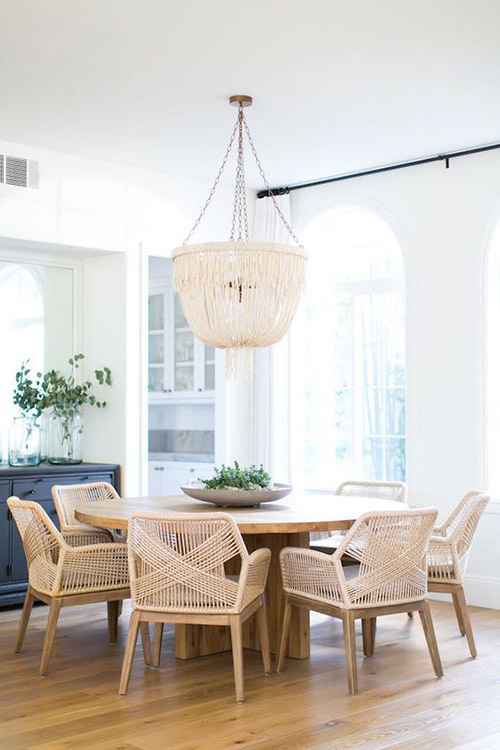 Just look at the very modern lines of the sofa table in the family room, light fixtures in the kitchen, and woven chairs in the dining room. To me, it’s perfection! Plus you don’t have to live at the beach to embrace this style. Will it look as grand as the gorgeous Modern Coastal rooms above – well, no! One, I have a limited budget and two it’s a small powder room LOL. However, it will be a cool mix of elements that reflect the feel of these rooms. Taking cues from these rooms, my own personal style, and needs of the small powder room Modern Coastal is the perfect solution to bring the pitiful powder room into line with the rest of my home. Do you know what solidified my design direction? If you know me, you know the answer COLOR! Behr Announced the Color of the Year for 2019 and this is it! This little blue swatch of paint got my attention the minute I saw it! I knew this was going to be at the heart of my powder room makeover. 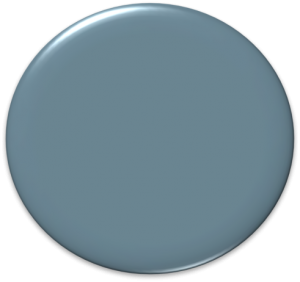 What a beautiful shade of blue and it evokes all things coastal! 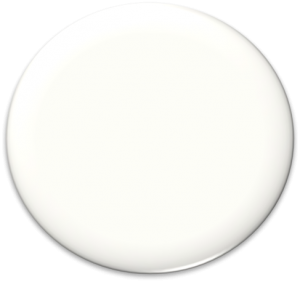 Next, I needed a pretty white for the board and batten. I’d love to replace the vanity, but it’s not in the budget so I needed a base color for my vanity faux finish and found this beauty. I reached out to my friends at Behr they offered to donate the paint for this project – yay! Knowing I needed some WOW factor in this space I went in search of a light fixture to be the focal point of the room. Remember my sad little crystal chandelier in the middle of the room? Well forget it! In previous projects, I’ve worked with Progress Lighting and knew they would have something amazing and I was right. Luckily, they were also willing to partner with me on this project. Hello, lover! Isn’t this Hangar Pendant AMAZING! It comes in silver tones too. I love the angular features combined with the soft shade. It’s big and impressive, but light and airy too. Exactly the modern element this space needs. After working at Amerock, my love for cabinet hardware runs deep. One of the last collections I helped design with the team and launch is one I’ve been wanting to use. My powder room makeover is the perfect project to incorporate a matte black finish with a clear pull. It’s the same feel the lighting evokes. A little open, with bold features. Glacio Pull from Amerock in Black Bronze. Then, I am going to attempt to use a simple black bronze bar pull as a towel holder. I’m not exactly where or how yet, but I have high hopes this will look great! Man oh man this was a hard choice and I looked at a TON of options – trust me. Originally I thought I wanted a large format tile, but it falls apart in a small room. Then, I got budget conscious wanting to spend money on labor not tile. Plus I love the elongated hexagon shape of the light fixture, so I decided to pick that up in the tile pattern. Jeffery Court Dovetail White tile was the perfect match and on sale at under $10 a square foot! This is a MAJOR wish, but not in the budget. I love this vanity from Pottery Barn, but am only using it for color direction. My plan is to create a faux finish using my indoor Pottery Barn Finish and outdoor driftwood finishes as a reference guide. Luckily, a new vanity top IS in the budget and I found a very affordable option with under mount sink included! I meant $56 bucks – I couldn’t pass it up! Ah, I am a girl who loves great mirrors. Using the shape of the light fixture and tile as my guide, I can’t believe what I found. It matches PERFECTLY! Don’t you love the unusual shape of this Shield Mirror? Here is the look fully pulled together for you to see how all of the products fit into the design plan. It’s going to be SO much prettier than before – not that it was hard to improve the looks of the powder room. Next week, I’ll be sharing this bathroom getting torn apart and can’t wait! This is my first albeit small renovation and so I am curious about each step in the process. My poor contractor Kip has had to answer a lot of questions, so I understand how it’s all going to go. It’s amazing a little room is going to get so much love! I’m excited to see the demo and watch the room slowly transform over the weeks. Please consider signing up for my weekly email newsletter, so you don’t miss an update. Follow along with my Instagram stories for a behind the scenes look every week. I love your plans! Good for you- doing the ORC again. I am still recovering from my last one! Have a great week! Great finish choices. I am so excited to see how this room turns out! Kimm, Thank you and good luck with your space as well! It’s quite a ride – just had a major hurdle with the light hit today. On to plan B! Hope everything runs smoothly – it seems to be a pipe dream for me LOL! I’m definitely a fan of modern coastal! Looking forward to seeing how your vanity comes out! Danielle, I’m excited to see how it comes out too! I’ll be practicing on a board first 🙂 Thanks for stopping by!